Southwest has announced it would add 20 flights to 12 new non-stop destinations if the airline is able to acquire two additional gates at Dallas Love Field. 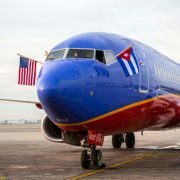 American must relinquish the gates under the terms of a settlement with the U.S. Department of Justice, but other airlines are also bidding for them. Together, Lufthansa and fast-growing low-cost subsidiary Germanwings will serve 211 destinations in 81 countries in their forthcoming winter flight schedules, a marginal expansion of services which includes at least one new destination, the Russian resort city of Sochi on the Black Sea.